Given that hectic work schedules often mean a missed gym class (or several), Barratt London has researched which parts of England are the best to live in, for those looking to get in their daily exercise by walking or cycling to work. To find out which areas of England are the best for those wanting to walk or cycle to work, Barratt London analysed the results of an official UK government exercise surveys, paying close attention to the frequency respondents from every local authority in England reported walking and cycling to work. Over 185,000 respondents answered the question of whether they walked or cycled to work once per month, once per week, three times per week or five or more times per week. The more often respondents from each area reported walking or cycling to work, the better that area was deemed as being for those looking for an active commute. Each response was given a weighted score by Barratt London to contribute to an overall ranking. In each of the above categories, the more respondents that reported greater levels of physical activity (walking or cycling to work more frequently), the more points that area accrued in Barratt London’s scoring system. For accuracy, every one of the 352 local authorities in England was surveyed and analysed. Which Boroughs of London Walk to Work the Most? 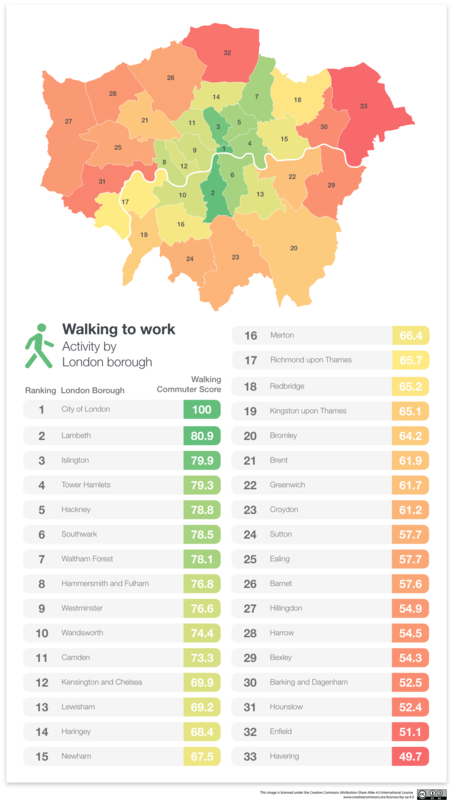 The complete analysis for England reveals that London is, by a clear margin, the best place to live for those wanting to get in their daily exercise by walking to work. Out of the top 20 areas that are the best for walking commuters in England, 17 of these are various boroughs of London. With 80% of residents walking to work at least once per week, 57% of residents walking to work at least three times per week and a whopping 43% walking to work five or more times per week, those living in the City of London get in the most exercise on their way to and from their place of work. Coming top in each of the respective categories, the city earns a Walking Commuter Score of 100 out of a possible 100. The boroughs of Lambeth and Islington came second and third, achieving a Walking Commuter Score of 80.9 and 79.9 respectively. Which Areas Outside of London Walk to Work the Most? 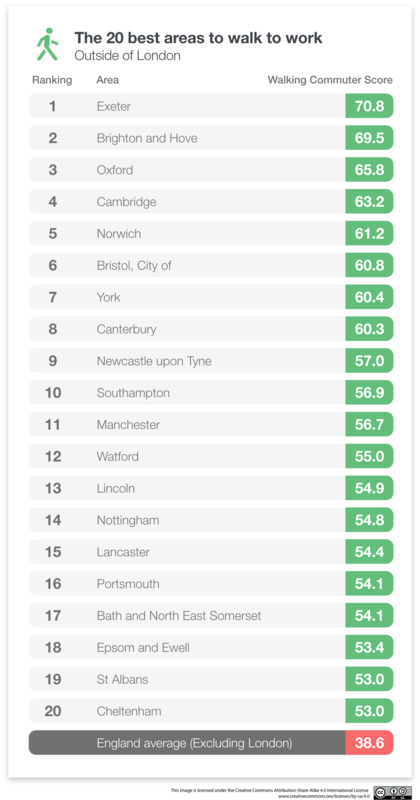 The answer to that question is Exeter, with a Walking Commuter Score of 70.8. An impressive 39% of residents from Exeter walk to work a minimum of three times per week, with a whopping 30% of residents walking to work five or more times each week. Brighton and Hove came in second place with a Walking Commuter Score of 69.5, followed by the world-renowned University cities of Oxford and Cambridge in third and fourth. Oxford managed to get one over their arch rivals, with a superior Walking Commuter Score of 65.8 to Cambridge’s 63.2. 26% of those living in Oxford report walking to work five or more times per week, in comparison to 25% of those living in Cambridge. On the whole, 42% of workers in England walk to work at least once per week, with 17% walking to work five or more times per week. Which Areas in England Cycle to Work the Most? But what about those looking to get on their bike? London no longer dominates like it did in the walking analysis, with just five boroughs making the top 20 list of best places to live for cycling to work. And it’s the University city of Cambridge that tops the table, with a Cycling Commuter Score of 94.8. 4.5% of the population of Cambridge cycle to work a minimum of three times per week, with an impressive 4.7% cycling to work five or more times per week. The town of Corby came second with a Cycling Commuter Score of 94.4, narrowly edging out the city of Exeter in third, with a Cycling Commuter Score of 94.3. In London, residents from Hackney cycle to work the most frequently – the inner London borough earns a Cycling Commuter Score of 88.3. Hammersmith and Fulham came second in London with a Cycling Commuter Score of 80, followed by Westminster in third with a score of 77.2. Which Cities Post About Their Exercise the Most on Instagram? But which cities in the UK share their exercise habits the most on social media? Analysing over 10 million Instagram posts from the past year tagged with at least one of the most popular fitness related hashtags – such as #Fitness, #FitnessMotivation and #FitnessJourney, Barratt London can reveal that the city that shares their exercise habits the most online is London. With over 1.9 million fitness themed posts, it’s clear that Londoners are keen to keep themselves fit and inspire others to do so. Manchester came second with over 330,000 fitness related Instagram posts, with Birmingham placing third. Do you want to share the statistics and graphics from this piece? Please do! We just ask that you credit Barratt London and link to this page. If you would like to download the full fitness data-set, please get in touch. Here at Barratt London we have a number of great properties available in and around the capital. Browse new flats and houses near South, North, East and West London. Don’t forget to check out our offers to make your move easier including London Help to Buy, Movemaker and Part Exchange. Data sourced from GOV.UK and Instagram.